SPUTNIK NEWS – June 20, 2018: Germany has sent a request to the United States about upgrading the Eurofighter Typhoon jet to handle nuclear bombs, pitting Berlin’s commitment to multilateral defense in NATO against a desire to rely on European-made jets instead of US-made alternatives. Germany’s Lt. Gen. Karl Müller was fired from his role as chief of staff of the German Air Force for supporting Berlin’s purchase of Lockheed Martin’s F-35 aircraft in March. With Müller out of the way, German officials seem keen on moving forward with buying the Eurofighter Typhoon. However, according to Germany’s NATO commitment, it must field jets capable of carrying nuclear weapons, and that means upgrading the Eurofighter to handle the powerful bombs. TASS – March 23, 2018: The poisoning of former Russian military intelligence (GRU) Colonel Sergei Skripal and his daughter, which took place in the British city of Salisbury, is a fake story being used for specific purposes, Russia’s Permanent Representative to the European Union Vladimir Chizhov told the Rossiya 24 TV channel. “The chemical weapons incident, which occurred in the city of Salisbury… is nothing but a fake story, which, I think, is being used for specific purposes,” the envoy said, adding that one could only feel sorry for those suffering from the poisoning. Chizhov also said that the British media’s information campaign over the incident was going downhill. “British newspapers have been showing more interest in US tariffs recently,” he noted. RT – April 3, 2018: Campaigning Australian journalist and filmmaker John Pilger has warned that the current propaganda war being waged by the West against Russia and China could escalate into a “real” war if it continues. “This is about a war on freedom of speech. This man is being denied the most basic right – freedom of speech,” Pilger told RT. “It’s part of a wider war against known enemies, Russia is one of them and China is another, but at the moment [it’s] on the propaganda stage,” he added. 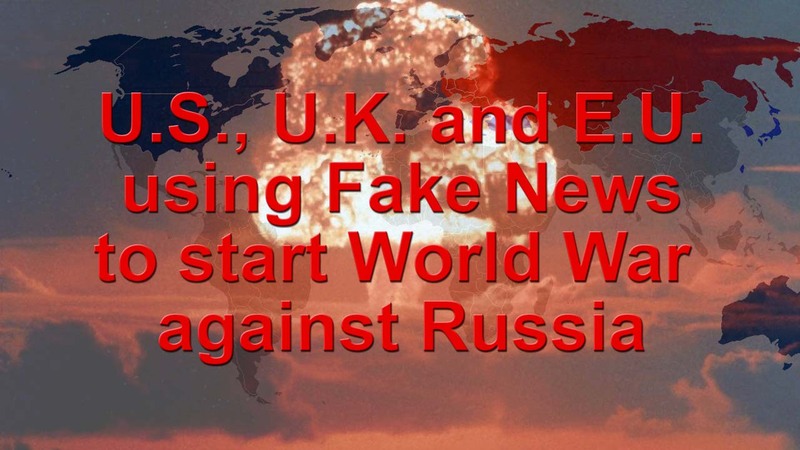 Pilger cautioned against the grave implications of the West’s current information war, as he said: “Forget about the whole idea of trade war, we’ve got the prospect of a real war unless this propaganda war is seen through. The attack on [Assange] and WikiLeaks over the years is so important because it does what journalists should be doing and that is holding great power to account,” Pilger added.